VANCOUVER, Canada (CNN) -- A small band of sailors are facing a summer of raging Arctic storms, cramped quarters and soggy clothes in their search for the human face of climate change. All hands on deck: The crew of the Silent Sound before their voyage through the Northwest Passage. 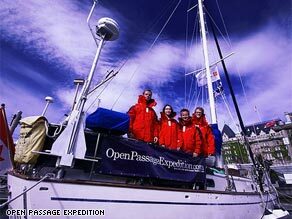 The Open Passage Expedition sets sail from Victoria, BC on June 6 on a 40-foot yacht to navigate the Northwest Passage from west to east on a mission to learn more about how climate change is impacting Inuit communities and tell that story to a global audience. Our four-member team plans to produce a book and film on this topic and as well as writing updates for CNN.com we are publishing a blog on our Web site. Scientists provide valuable data proving the Arctic is undergoing unprecedented change and showing how this threatens the wildlife and landscape. However, we want to hear about how these changes are impacting people in their every day lives. We want to hear from the people at the center of these international debates over sovereignty, energy, environment and wildlife conservation. The expedition team includes a shore-based scientific adviser, and we are partnering with World Wildlife Fund to ensure that we understand the scientific facts behind the stories we hear. The Northwest Passage has lured sailors for centuries with its promise of a short cut for trading ships sailing between Asia and Europe. Hundreds of men died trying to find a way through the ice, and it remains closed to all but the strongest ships and hardiest seafarers. An increasing number of private yachts are now transiting the Northwest Passage every year, with 35 recreational yachts having completed the trip since Roald Admundsen became the first to do so in 1906. However, ice, unpredictable weather, hidden shallows and a lack of rescue support still make this one of the world's most dangerous places to sail. Climate change has meant less ice during the summer months, making this trip easier than it once was, but we are still making safety our priority by taking along safety gear such as immersion suits and by reinforcing the bow of our yacht with Kevlar to better deal with the ice. As leader of this expedition, I've tried to prepare the crew for a summer of ocean storms and living aboard the Silent Sound for around four months. We hope to round Point Barrow by the end of July and be in the heart of this infamous Arctic route throughout August, with plans to be in Halifax, on the east coast of Canada, by early October. Our 7,000 nautical mile voyage will take us through one of the most isolated parts of the world.